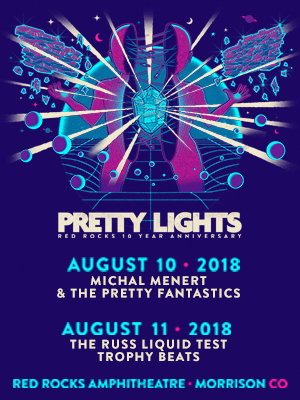 Pretty Lights Live will perform at Red Rocks Amphitheatre in Morrison, CO on August 10-11. Special guests include Michal Menert & The Pretty Fantastics and Mux Mool (August 10) and The Russ Liquid Test and Trophy Beats + special guests Illuminati Congo & motifv (August 11). A free PL webcast live from Red Rocks Amphitheatre will be available to stream on August 10th and 11th at 8:30pm MT on Facebook and YouTube.